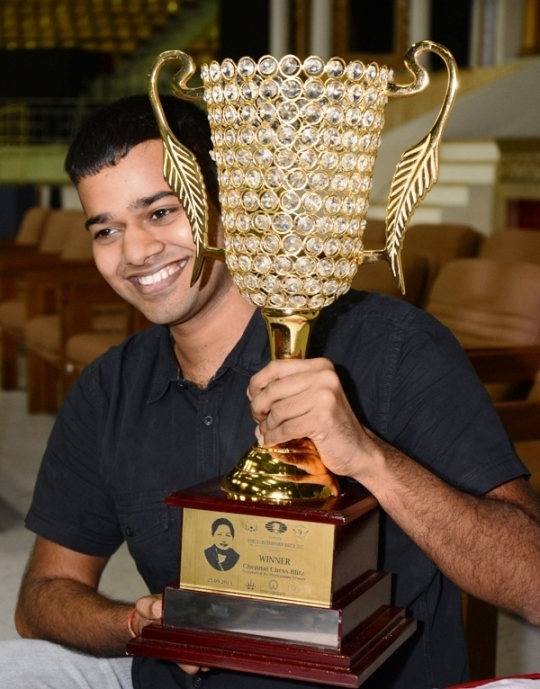 Grandmaster-elect V Vishnu Prasanna of Chennai with 8.5 points from nine rounds, emerged the champion in the Chennai Chess Blitz 2013 that was held at Multipurpose Indoor Stadium, Chennai. He secured the winner’s purse of Rs. 90000 (Rupees Ninety thousand only). 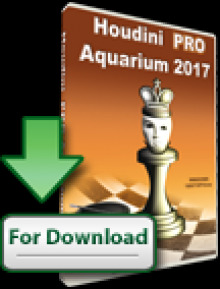 Remaining undefeated Vishnu was impressive in his title march defeating three Grandmasters viz., Deepan Chakkravarthy, B Adhiban and Shyam Sundar, on the way. 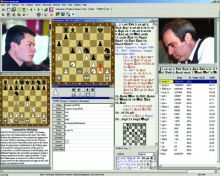 He shed a lone draw to former TN State Champion M Kunal. 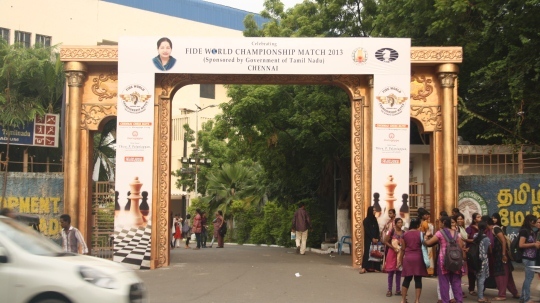 Woman Grandmaster and many times National Woman Champion Vijayalakshmi Subbaraman finished as the best woman player scoring 7 points. 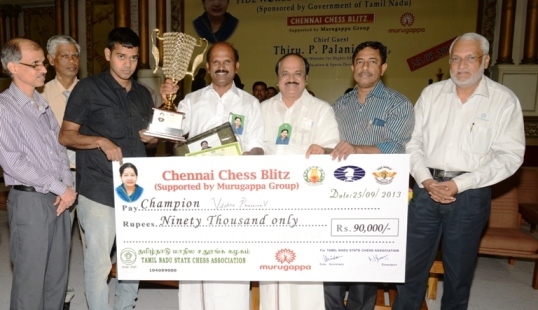 The mega blitz event was supported by Murugappa Group. 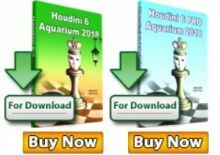 Cash prizes for Rs. 405000 (Rupees Four lakhs and five thousand only) were distributed to 90 players by Honorable Minister for Higher Education Department – School Education Department, Youth Welfare and Sports Development Department Thiru P Palaniappan. Present in the dais were Thiru Md. 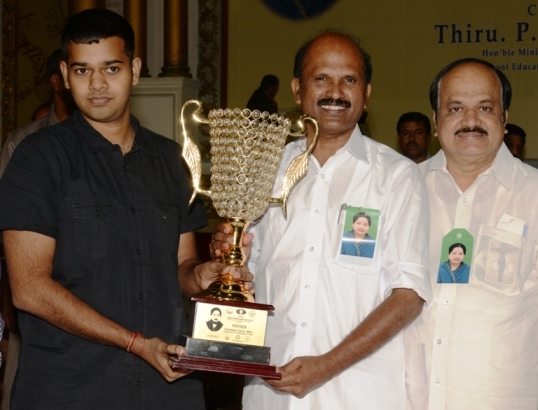 Nazimuddin, I.A.S., Principal Secretary to Government, Youth Welfare and Sports Development Department, Thiru K Rajaraman, I.A.S, Principal Secretary & Member Secretary, Sports Development Authority of Tamil Nadu, Thiru JCD Prabhakar, MLA, President, All India Chess Federation, Thiru S S Gopalarathnam Managing Director, Cholamandalam MS General Insurance, a joint venture of Murugappa Group, Thiru D V Sundar, Vice President, FIDE (World Chess Federation) and Thiru V Hariharan, General Secretary, Tamil Nadu State Chess Association.